Here are the events and activities the sisters of the Beta Alpha chapter are participating in! Check out more photos from our events in the photo gallery! This semester we were able to visit Fenwick Island in Delaware and relax for a weekend at the beach. Even though it was a little windy, the sisters had a great time. We did a few arts and crafts, had a photoshoot on the beach, and played some games at the beach too. 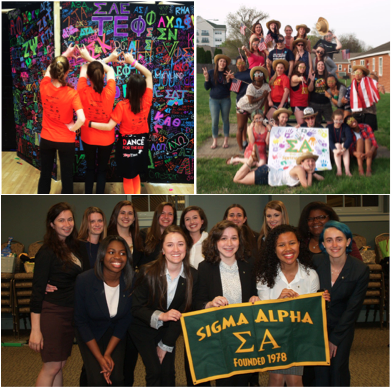 The sisters have been participating in so many events; from an etiqutte dinner, to volunteering at the MLI Gala and at EcoCity, being a part of the Professional Greek Council's Meet the Geeks event, to attending a sisterhood potluck! It has been a great year, and even though we are saying goodbye to our graduates, we welcome 10 new sisters into the sorority! This semester we have had the opportunity to get to know a lot of lovely girls during our rush events! Out of those who participated 12 ladies have moved on to become our MC's for this spring and have now been activated to become our 12 newest sisters! For retreat we stayed in Solomon's Island and had such a great time! We did crafts, played games, studyed, and visited Calvert Marine Museum. We had sunny weather the entire time and it made for a very relaxing weekend. Our chapter has had the chance ot participate in a lot of philanthropy events this semester. Alongside the AGR chapter at UMD, we participated in Terp Thon. Our team raised $1,112 and the total raised amounted to $604,318.24! It was a blast and hopefully we can continue to have a team and participate in this event. We have had a clothing drive and a toiletry drive, where the donations have gone to local donation centers. 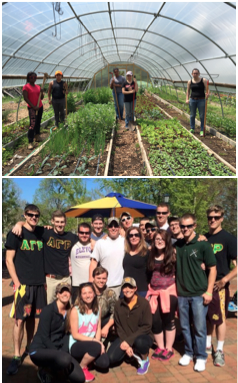 We have also volunteered at EcoCity Farm, where our sisters helped out and had fun doing it! That same day, some of our sisters and brothers of AGR participated in the Out of the Darkness campus walk at St. Mary's College. The team raised $1,900 for the American Foundation for Suicide Prevention. 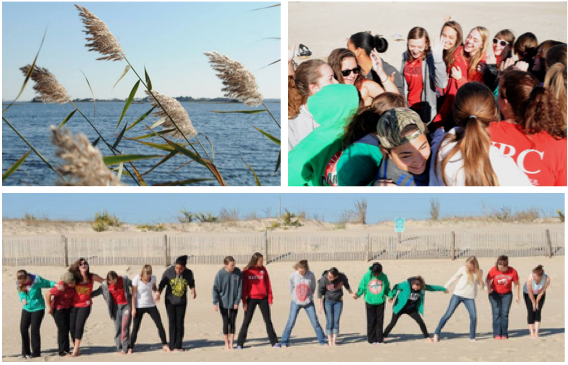 Despite Fenwick Beach in Delaware being chilly, the sisters and MC's had a blast at retreat! We did team bondng and team building games outside on the beach, a letter writing campaign to raise money for the sorority, and one of the nights we had a murder mystery to play. The entire time was great for sister bonding! With the chapter down to only 11 active sisters, Fall Rush was important. So we all dove into it enthusiatically with a Sigma Alpha information session, T-shirt painting, the AGNR New Student Welcome and an awesome Barn Party with our brothers, AGR. After all our hard work, we have a MC class with eight wonderful ladies. We were also delighted to send three sisters to the National Convention in Omaha, NE to represent the Beta Alpha chapter. They furthered professional development, met sisters from all around the country and heard some great speakers, including the 2011 Miss America, Teresa Scanlan. It has been a busy Fall for the sisters. With everyone coming back from summer break, we had to get in rush mode, which was lots of fun. The Beta Alpha chapter has grown with eight new ladies. There was also the AGNR open house in Clarksville where the ladies had a table with face painting and were taking donations for Heifer International, which send livestock animals to third world countries to help stimulate economy, as part of our philantrophy goals. 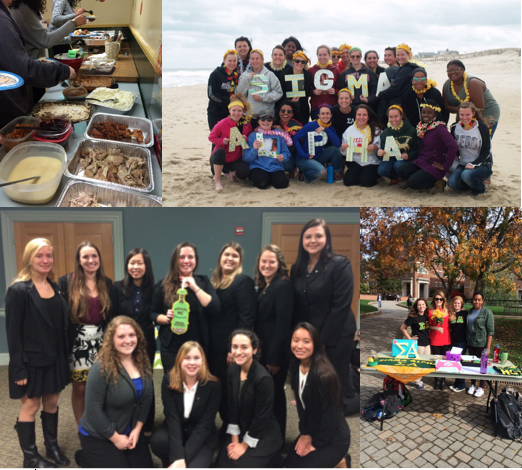 April was a busy time for the Beta Alpha chapter. We had our retreat at Leaton's beautiful cabin in the Shendoah Valley where we visited Lurrey Caverns and discussed the upcomming year! We welcomed our newest active sister, Jaclyn, who has lots of ideas to make our fall rush a huge success! Later in the month many of our ladies participated in "Ag Day" where they showed off their lambs, pigs, heifers, and steers. Amanda won the overall award for dairy, with Brit as runner up! Emily J won overall for pigs and lambs! Congrats to all who participated and thank you to everyone for all of the hard work painting faces and selling trees at our booth! Usually the Beta Alpha chapter "Ag" girls are getting down and dirty with their animals on the farm or in the field with the crops and soil. For this year's Emerald Ball our theme was "Belle of the Ball" the Beta Alpha ladies cleaned up well for a night of great food, music, dancing, and fun. Each and every girl ditched their muck boots, ripped jeans, tee-shirts, and ball caps for heels, dresses, and makeup (and looked fabulus)!!! This is the Beta Alpha's 2nd Annual Emerald Ball- thank you to all who made it a huge success! The Beta Alpha Chapter girls spent the weekend "Gettin' down in the hay...The Sigma Alpha way"! at our fall retreat camping in beautiful Northern Baltimore County. It was a chilly late October weekend, but we all stayed warm with a HUGE bonfire and lots of s'mores! On Saturday we enjoyed some friendly competition as teams navigated a several mile long corn maize! Later everyone participated in pumpkin painting and a hay ride. Thank you to all who made this weekend possible through organizing activities and the land doners for letting 20+ girls camp on their property! The ladies of the Beta Alpha chapter had a great time working at the College of Agriculture and Natural Resources Open House on October 2nd! Face painting and piggy puppets were all the rage at our table this year! Even the Dean Wei, AGNR's Dean joined in on the fun! A great time for children of all ages, everyone enjoyed the rifle practice, free pumpkins, chocolate milk, popcorn and make your own gummy worms, the dairy farm and equine pasture tours, and all of the other wonderful organizations who attended. Thanks to a successful info/rush week full of linedancing lessons, our charter day celebration, Fall Bash, the cook out with the guys of AGR and a wonderful tour at the USDA center in Beltsville, we can finally say congratulations to the Omicron MC Class! beach get away. Blessed with great weather, the girls enjoyed camping on the beach, cooking over an open flame, sunbathing on the Atlantic Coast and fighting off curious wild horses. Soon after, all of the members participated in the University of Maryland's annual Ag Day. We sold many different beautiful plants and baked goods, educated the public about where the food comes from and many of the sisters participated in the livestock show. It is an honor to say that all of the female participants in the livestock show that went to compete for the title of Grand Champion Showman were members of the Beta Alpha chapter. Good job girls! March of 2010 was an exciting month for the Beta Alpha sisters as we had our first ever annual Emerald Ball. Traditionally, the Sigma Alpha chapters have an annual formal dance/dinner event called the Emerald Ball. This year, our Emerald Ball was themed the Emerald City from the Wizard of Oz and was held in College Park, MD. Thanks to a special group of girls, the formal was a total success. The current sisters of the Beta Alpha chapter would like to welcome the Nu class of the Fall 09 semester. Congratulations Dani Wysocki, Emily Koemeter-cox, Dani Nase, Molly Hancok, Brooke Ruhl, and Elena Bode! Pictured: The newly activated ladies holding the MC instructor and 2nd VP, Vicky Lake. Our "Down n Dirty" Fall 2009 retreat was to The Buck in Lancaster, PA; a mud bog for huge trucks and some crazy people. The girls camped out at a sister's house in Harford County where we made deer stew over a camp fire and did crafts for the MCs. The next day, the sisters attended a local fair and did a little fundraising. With grilled cheeses, baked goods, kids crafts about farm animals and face painting, we were the most visited booth! Later, we continued our drive north to The Buck to watch some literal mud slinging. In the Spring of 2009, we took our retreat at a new member's farm on Maryland's Eastern Shore. Arriving in the later evening, all of the members stayed the night and enjoyed a bon fire, s'mores, chapter activities and more. The next day, after eating a huge down-home breakfast and planning and brain storming for the the Fall of 2009, the sisters had an exciting day learning about gun safety, how to fire a gun, and tips on shooting sporting clays. The event ended by having a shoot-out competition. The sisters of the Beta Alpha chapter would like to welcome the members of the Mu class in the spring of 2009. Congrats to Emily Jellick, Colleen Nieman, and Ateeyeh Atefat. As we do many professional events through out the year, in February of 2009, we invited Mrs. Rebecca Chaney to come and speak to us about her experiences within the local agricultural industry. As an author, Mrs. Chaney also told us about her experiences working on a cattle ranch in a desolate region in Australia which she later wrote about. The sisters were honored to have her sign her novel. Every Semester, the sisters of the BA chapter take a weekend retreat to collect, bond, plan for the next semester, and to have a great time! Our first retreat in the Fall semester of 2008 was to Harpers Ferry, WV. Here, we camped out, took a ghost tour of the civil war struck town, and had a great time learning about the intense history of the area.